Designed for vegetable and flower gardens, or small holdings. This machine features and excellent combination of easy handling, strength, durability and superior performance. Compact and lightweight, they allow problem free tillage even in confined spaces or around low vegetation. Maximum reliability, thanks to chain transmission guaranteed 3 years. Reinforced chain guard withstands flying stones and accidental impact. Ergonomically designed levers and selectors all within easy reach, ensuring constant control of the machine when in motion. Fully adjustable handlebars for more comfortable operation on any type of soil. With handlebars in the offset position, the operator can walk to one side without threading on the tillage area. 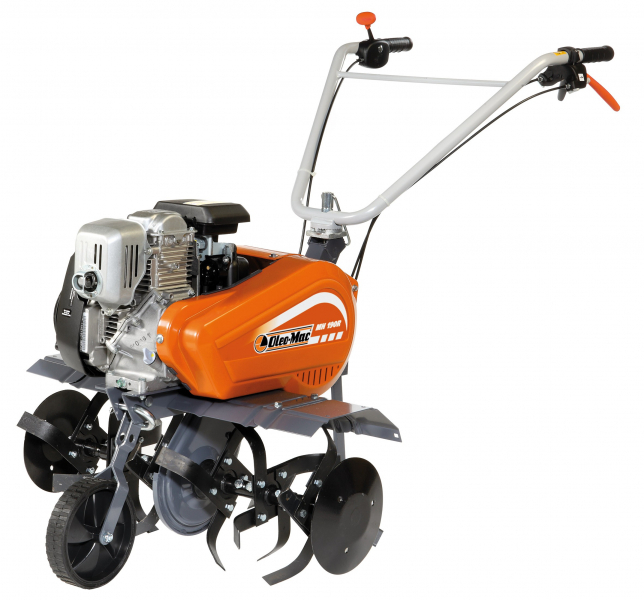 The front wheel, used for transport purposes can be raised when the machine is in operation and engaging the soil. R models have a reverse gear to facilitate manoeuvres and help reposition the machine corruptly during tillage operations.